As early as July 24, a week at least before any declaration of war was uttered, Austria had begun the secret mobilization of her armies, expecting to gain an unfair advantage in the war, which both she and Germany were determined to provoke. By the method of conscription she had hoped to raise an army of 2,000,000 soldiers, before the Russian forces could be mustered. This plan, however, had been frustrated in part by the widespread rebellion of the Austrian Slavs, a subject people comprising one-half the entire population of the Empire, and whose sympathies were wholly with their Russian brethren. Slavic outbreaks took place in Dalmatia, Bosnia, Croatia, and other provinces of the Empire, while in Herzegovina several government officials were assassinated. In repressing this rebellion, Austria adopted stern measures of reprisal. Slavic societies were dissolved, hostile newspapers suppressed, Slav leaders imprisoned, and all men up to fifty years of age drafted for the war. As the mobilization proceeded, the Slav regiments were kept separate from the Teutonic units, to prevent any possible contamination of the Huns, yet in despite of these precautionary measures, the Slavs continued to mutiny. The rebellion spread into Poland and Bohemia, endangering the entire mobilization, but finally, on August 6, Austria had succeeded in mobilizing three large armies comprising 1,200,000 unwilling troops. These forces were directed by the supreme commander, Archduke Frederick. Russia, in the meantime, had been successful beyond all expectations in her first mobilization. Instead of requiring six weeks, as had been predicted, to complete her first mobilization, Russia in ten days had succeeded in concentrating 450,000 trained troops on the Baltic frontier, while 800,000 other troops were assembled on the strategic line between Ivangorod and Brest-Litovsk. A fortnight later, Russia had drawn 1,700,000 first line troops into the area of battle and in addition 2,400,000 reservists were rallying to the Czar's standards. We have traced already the movements of Russia's Baltic armies throughout the disastrous campaign in East Prussia; now we shall portray the triumphant march of the three main Russian armies through Austrian Galicia. The Austrians, whose first mobilization had been completed in advance of that of the Russians, were the earliest to put their armies in motion. They had concentrated in eastern Galicia, just south of the Russian Poland salient, three groups of Austrian armies under the command respectively of General Dankl, General Auffenberg, and Archduke Joseph. These generals, having foreseen the inevitability of a Russian invasion of Galicia, thought to forestall it by carrying the war into the enemy's country, before ponderous Russia could get her armies underway. The Austrian strategic plans embraced three concurrent movements. One army group, in command of General Dankl, was to cross the Polish frontier and advance on Warsaw by way of Lublin, with the purpose of keeping the Russians so busily engaged in defending the Polish capital, that they would find it impossible to attempt the invasion of Galicia. A second Austrian army, under command of Archduke Joseph, was to guard Dankl's left flank and at the same time occupy that part of Poland lying west of the Vistula. A third Austrian army group, under General Auffenberg, with its base resting on Lemberg, was assigned to protect Dankl's right flank, and at the same time extend eastward across the entire northern frontier of Galicia. We shall here anticipate the march of events, by revealing that the far abler Russian strategists had divined the purpose of the Austrian generals, from the beginning of the offensive, and adopted measures to circumvent them. There were three Russian army groups assembled at this time on the strategic line east of Warsaw, under the command respectively of General Ivanoff, General Russky, and General Brusiloff. To Ivanoff's group was intrusted the defense of the Polish salient, and particularly the wide gap near Lublin through which Dankl's Austrian army hoped to penetrate on its march to Warsaw. Only an inconsiderable body of Russian troops had been posted on the Polish frontier, since it did not comport with the Russian strategic plans to offer immediate battle to Dankl. Instead, it was Ivanoff's purpose to fall back from the border, drawing Dankl as far as possible from his base, and out of touch with Auffenberg's army on the right. At the proper time, a Russian wedge would be driven in between Dankl and Auffenberg's armies, their flanks rolled back and both Austrian armies destroyed. In this double flanking movement, the Russian army groups, commanded by Russky and Brusiloff, were to cooperate. Brusiloff was to cross the Galician border southeast of Lemberg and turn Auffenberg's right flank. Russky at the same time was to cross the Galician frontier, northeast of Lemberg, and break through the Austrian line at the point where the wings of Dankl's and Auffenberg's armies joined, roll Auffenberg's left flank on Lemberg, and then, with his main army force Dank'l's right wing back into the morasses of Poland. All these strategic movements were successfully carried out. Let us now study them in detail. General Dankl's Austrian armies had crossed the Polish frontier on August 10, deploying on the right bank of the middle Vistula. Pursuant to their instructions, the Russian border troops fell back. Advancing unmolested, the Austrians occupied Kielce and other nearby towns. The Russians continued to retreat northward before the Austrian hordes. All unaware that he was being led like a lamb to the slaughter, Dankl was permitted to win an easy victory at Krasnik on August 26. From Krasnik, the Austrians pressed forward to within ten miles of the Lublin gap. Here their advance was definitely stopped by Ivanoff's main armies, commanded by Generals Ewerts and Plehve, and spread out on a front of 40 miles. Having drawn Dankl into their trap, the Russian generals proceeded to close it. The honor of springing the trap fell to General Russky. Russky's Russian army, on September 17, 1914, crossed the Galician border, on a 40-mile front, between Brody and Sokal, to the northeast of Lemberg. Striking hard at the Austrian line, he broke through at the point of j unction of Dankl's and Auffenberg's armies. Then, with his left and center, he rolled back Auffenberg's flank toward Lemberg, while with his right he turned Dankl's flank, forcing the latter to flee westward and take refuge in the swamps near Bilgarej and Tarnograd. Thus, in the twinkling of an eye, both the Austrian armies had been completely isolated and could be dealt with separately. Meanwhile, General Brusiloff s Russian army group had crossed the Galieian border to the southeast of Lemberg and attacked Auffenberg's right flank. A three days' battle ensued at Tarnopol, ending in its capture by the Russians on the 27th. Retreating southward and fighting stubbornly, the Austrians entrenched at Brezezany. Russky took this city by direct assault, the Austrians retreating in good order. The two Russian armies by this time had established connections, and were stretched out on a battle line some 200 miles long, in the form of an arc, extending from west of the Vistula to the Gnila Lipa River. Auffenberg, reinforced by the greater part of Archduke Joseph's reserve army, fell back to a strong and carefully prepared trench position, before Lemberg on a 70-mile front, extending from Busk in the north to Halicz in the south. Here was fought one of the most sanguinary battles of the war. General Brusiloff's Russian army, after forcing the cross of the Zlota Lipa on August 26, 1914, made a wide detour, as far south as the Dniester, flanking Auffenberg and furiously assaulting his right wing, near Halicz, on August 30. The Austrian line was pierced on the following day, the entire right wing giving way. In their retreat, the Austrians attempted to make a stand at Botszonne, but the Russian guns blew the town into fragments. The Austrian retreat on the right became a rout. Guns, transport and all impedimenta were abandoned in the wild flight. Many thousand Austrians were killed and more were captured. Meanwhile, Russky's army had been closing in on Auffenberg's left wing. For-days violent fighting had occurred. Every inch of ground was contested. There were many desperate bayonet charges, and much man- to-man fighting. Positions were taken and retaken many times. The whole terrain was literally plowed up with shell fire. The losses on both sides were enormous. Finally, on September 1, the Austrian line was breached and gradually began to give way. Lemberg itself was stormed at 2.30 on the morning of September 1, 1914. The Austrians had attempted to re-form their line, but were thrown into confusion by repeated artillery and cavalry attacks. Both their flanks had wilted, their center was being pounded hard, and the Russians had begun an encircling movement, intending to surround and capture the army entire. It was necessary at once to evacuate Lemberg if the remnants of the army were to be saved. 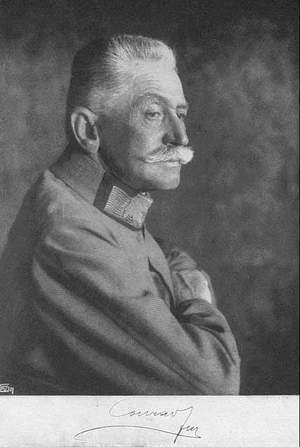 As the final retreat of Auffenberg's main forces began, he threw out a rear guard screen of Slav and Hungarian troops to hold the Russians in check. The Russians countered by pouring a terrific artillery fire over the heads of the advancing Slavs and upon the retreating Austrian army. Under this rain of projectiles, the. Austrian ranks broke in wild disorder. Abandoning guns, ammunition, and stores, Auffenberg's army retired precipitately. Lemberg being left undefended, the Russians entered the city on September 3, 1914, being hailed as deliverers by the 200,000 Slav inhabitants. With the capture of the fortress, 120,000 prisoners, 200 cannon, and enormous stores of war material fell into the hands of the Russians. This great victory, coinciding as it did with Samsonoff's defeat at Tannenberg, filled the Russians with elation. While Auffenberg's army was being destroyed before Lemberg, Dankl's Austrian army also was facing a critical situation in the swampy country about Bilgarej and Tarnograd, where it had been isolated. In his desperation, Dankl attempted to break through the Russian wall between Lublin and Kholm. The Tenth Corps led the assault against Ivanoff's Russian line, but they could not break through. 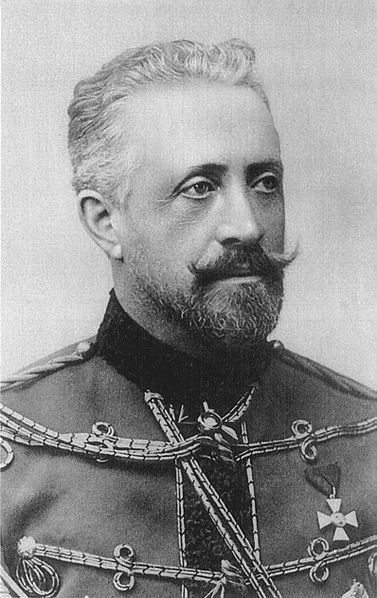 The Russians, by massing their chief strength against Dankl's left wing, and threatening his development, compelled the retirement of his entire army. Attacked on his entire front and right flank from Tomaszon to Tarnograd, Dankl hastily retreated toward the San River, near its junction with the Vistula. Two heavy rear guards, to north and east, were left to hold back the oncoming Russians, while the main body and the baggage were crossing the river on September 12, 1914. But even so strong a defensive position as the swampy valley of the San could not withstand the impetuous advance of the Russians. Wading the river in water up to their necks, the Russians fairly leaped upon the shoulders of the retreating Austrians, taking 30,000 prisoners. Meantime the Russian artillery was shelling the bridges which the main body of the Austrians were crossing in solid masses. Besides the thousands killed by shell fire, hundreds of Austrians were forced into the water and drowned. With the remnant of his army Dankl managed to escape to a position of safety on the line of the Wistoka River, which he reached on September 23, 1914. After the defeat of Auffenberg’s army before Lemberg, the survivors had retreated and formed a junction with a newly formed Fourth Austrian army. The united forces occupied a well fortified line, 60 miles long, based on Grodek in the south and Rawa- Ruska in the north, and with excellent railroad facilities in their rear. The Russians attacked the Austrians at Grodek on September 8, 1914, taking many prisoners and doubling the entire line back on itself at a sharp angle at Rawa-Ruska. Here a terrific eight-day battle was fought, with 300,000 men engaged on a six-mile front. 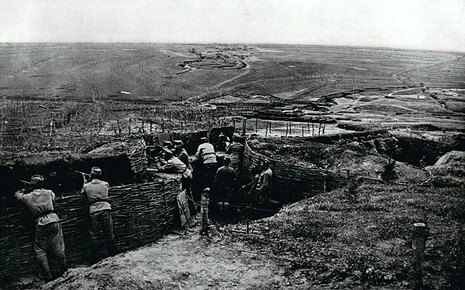 The Russians concentrated their attack on the very apex of the Austrian angle, atop the bluffs at the edge of a ten-acre field. Eight successive assaults were repulsed by the Austrians. Some positions, before being finally evacuated, were taken and surrendered several times. The armies, each in turn, would retreat a short distance, re-form and renew the offensive. At one point the Austrian position was so deluged with shrapnel that the ground was covered by dead, but the Austrians held on tenaciously. Day by day they gradually yielded ground, until at length they made their last stand on the crest of the ridge defending Rawa-Ruska. Here the Russians brought into play their huge howitzers, crumbling up the Austrian defenses. Then they stormed the hill, expelling the Austrians at the point of the bayonet. By nightfall, the Austrian center was broken and the Russians were dropping shells into the outskirts of Rawa-Ruska. The town was hastily abandoned by the Austrians, who retreated toward the San River, some 70 miles west of Lemberg. The Austrians were by this time scattered in flight. Since the Galician campaign opened they had lost 250,000 in casualties, besides 120,000 prisoners. Two of their armies had been partially destroyed. 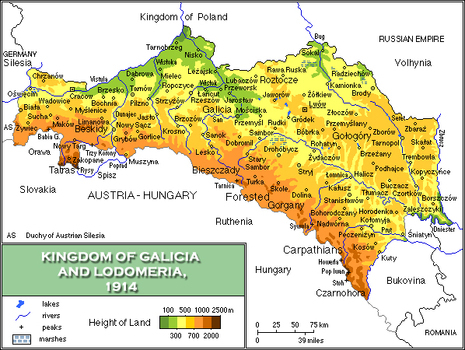 They had resigned most of Galicia, including the great oil wells of Lemberg; had surrendered half their Galician armies and vast quantities of war supplies. The Russians, in quick succession, had occupied nearly all the important cities and fortresses—Lemberg, Brody, Busk, Tarnopol, Brzenany. The remnants of Dankl's army had been driven to the line of the Wisloka. The Cossack cavalry forces were approaching all the Carpathian passes which lead into Hungary. Przemysl and Joroslav alone held out. The remnants of the three Austrian armies, after their several retreats from Lemberg, Rawa-Ruska, and Halicz, escaped to a prepared position of great strength on the western bank of the San River. There they were joined by three German corps. The new battle area, extending 32 miles east and 16 miles north, was enclosed by the double turn of the San and its confluent, the Vislok. The corner points of the rectangle were protected on the north by the fortresses of Rozozoff and Dynow, on the south by the fortresses of Przemysl and Jaroslav. A light railway, built solely for strategic purposes, ran parallel with the left bank of the San almost to its confluence with the Vistula. The Austrians had spent enormous sums to make this position impregnable. Moreover, as they crossed the San, they destroyed most of the bridges behind them. But the Russians, in swift pursuit, were not to be balked of their prey. By a brilliant stroke, they seized the bridge at Krzeszov, a few miles west of Tarnogrod. The Russians, on September 20, 1914, began the bombardment of Jaroslav. After three days of incessant shell fire, the powerful fortress was evacuated, the city itself being then in flames. With the surrender of Jaroslav, the Austrians were forced to abandon the line of the San River and the railroad from Cracow to Przemysl. There remained for the Russians to capture first Przemysl and then Cracow on the German frontier. Once Przemysl had fallen, the Russian flank would be protected by the Carpathians, and the way to Berlin would be reopened. Przemysl, a powerful fortress, defended by a garrison army of 100,000, under command of General Kusmanek, was surrounded by the Russians on September 20, 1914. The bombardment opened without delay, the Austrian guns answering shot for shot. Due to the treachery or incapacity of the Russian War Ministry, the shells for the huge Russian howitzers were not forthcoming, and the smaller field guns were ineffective in reducing the fortress. Nevertheless a vigorous bombardment was kept up until October 2, when the Russians demanded the surrender of the city. General Kusmanek refused to discuss surrender until all powers of resistance had been exhausted. Lacking heavy siege guns to enforce this demand, the Russians repeatedly and recklessly stormed the fort. The corpse-strewn ground soon revealed how costly the efforts had been. Finally, a Russian brigade approached the walls of the fort undetected and stormed the walls. The garrison retired to the casemates, from which they opened fire with machine guns. Undismayed, the Russians stormed the casemate and a hand-to-hand battle ensued, with bayonets, gun butts and hand grenades. With the arrival of Austrian reinforcements, the Russian division withdrew. The Russians then settled down to a routine investment of Przemysl, awaiting the arrival of their seige guns. While one part of the Russian forces was investing Przemysl, another was advancing westward toward the German frontier, driving the disorganized hordes of Austrians and Huns before them. Two principal objects the Russians kept in view. One of these was the capture of Cracow, near the western extremity of Galicia, possession of which would open the way either for an advance on Berlin through Silesia or an advance on Vienna through the Moravian Gate. The other was to secure the passes of the Carpathians, which would give access to Hungary. A successful conquest of Hungary bore with it the assurance of an early peace with Austro-Hungary. On November 11, 1914, the Russians converged on Cracow from two directions. One column of Russian troops, operating out of Jaroslav, occupied Miechow and Dynow. A Russian force further south seized Lisko. But on the following day the Russians sustained a defeat near Czernowitz, capital of the Austrian province of Bukowina. An Austrian army, reinforced by German divisions, crossing the Pruth River, suddenly attacked the Russian right wing, inflicting heavy losses. On the same day another body of Russian forces in the Stryj valley was surprised by Austrian cavalry and put to rout. In central Galicia the Russian advance was successful. The Austrians in that section were for the most part driven west of the Dunajec River, along the front from Tarnow to the Vistula. As the Russian advance toward Cracow proceeded, the Austrian resistance stiffened. On November 20, the Russians on the north had reached the outer line of Cracow's defences. Meanwhile, the Russian cavalry were pushing forward into the passes of the Carpathians. Alarmed at the encroachments of the Russians, Germany rushed an army to the assistance of the Austrians. By December 6, 1914, the safety of Cracow was insured by the arrival of several German corps. The trees surrounding Cracow were cut down to afford space for the artillery and various new lines of fortifications and wire entanglements were arranged. South of Cracow the Austro-German forces attempted to turn the Russian right wing, after destroying the bridge over the Dunajec and occupying the heights on the left bank of the river. The dauntless Russians, however, in the face of sustained artillery fire, crossed the Dunajec through icy water up to their necks and by vigorous assault captured the heights. On the following day the Austro-Germans made a stand on a fifty-mile front extending from Wieliczka south to the Dunajec. They were defeated with heavy losses, losing many prisoners and guns. In West Galicia events during the next few days favored the combined armies of Austria- Germany. The south wing of the Russian army was defeated at Limanovo and compelled to retreat. At the same time a third incursion of the German forces into Galicia was arrested by General Dmitrieff's army on the very border of the province, although they had crossed the Carpathians on a wide front between Wieliczka and the headwater of the San River. During the same week, the garrison at Przemysl, which was threatened with starvation, attempted to lift the siege by making a series of sorties, but each time were driven back with heavy losses. Germany had been steadily pouring her troops into Galicia, through the Dukla Pass, and now had an army of 500,000 trained soldiers assisting the Austrians. In addition, Hindenberg had launched his great offensive toward Warsaw, elsewhere described. The Russian raiding forces which had crossed the passes into Hungary were now compelled to withdraw. With the arrival of the Germans, the Russian offensive against Cracow was checked, General Ivanoff's Army was forced back 70 miles north of Cracow, compelling in turn the retirement of Dmitrieff's forces from the Dunajec to the Biala River. Still farther eastward, the army of General Brusiloff was holding its own against the Austrian army under General Ermolli. Early in December Ermolli tried to put a wedge between the armies of Brusiloff and Dmitrieff, but he was defeated with the loss of 30,000 prisoners. Meanwhile Hindenberg, in the Polish triangle, had forced back the central Russian armies. In Galicia, the combined Austro- German forces had closed the Silesian Gate into Germany, and saved Cracow from capture. ON Christmas day, 1914, the Russian General Staff launched a new offensive, this time among the mountain spurs of the Carpathians. Though outnumbered and outgunned by the Austro-German forces, the Russians advanced confidently on the Dukla Pass, the historic, road into Hungary from the east. Two Russian infantry regiments, under a murderous fire, waded waist deep in the icy water of the Jasiolka River, charged the Austrian line, and took many prisoners. South of the Vistula, the Russians swept the Biecz front of all the Austrian forces, taking 15,000 prisoners. The upper reaches of the Vistula were similarly cleared. In western Galicia, the Russians drove the enemy before them like sheep. The year 1914 closed on the Galician front, with the Russian troops everywhere successful, and aiming at the six passes over the Carpathians. As a result of disclosures made during these opening campaigns, General Sukhomlinoff, the Russian Minister of War, was tried for treason in September, 1914. It was proved at his trial that, for German gold, he had connived at sending Russian troops to their death in Galicia without necessary military supplies. It was also proved that he had received German money as a reward for holding up at Archangel large stores of ammunition which had been sent to the army by Russia's allies. The loss of this ammunition cost tens of thousands of Russian lives. In spite of his colossal crimes, this arch-traitor was merely sentenced to life imprisonment, though scores of loyal soldiers were being put to death daily for slight infractions of the military code. About this time, Czar Nicholas, by Imperial Decree, ordained that the name of the capital city, St. Petersburg, which smacked of the German, should be changed to Petrograd, a wholly Slavic word. If at the same time he had banished the vicious German court clique from Petrograd, he might have saved his Empire.